Yesterday was the United Nations International Day of the Girl Child so for today's Feel Good Friday, I'm going to profile an organization that's helping girls around the world, She's the First. Founded in 2009 by Tammy Tibbetts and Christen Brandt as an effort to get Millennials to support girls' education, She's the First "fights gender inequality through education. We support girls who will be first in their families to graduate from high school and train students everywhere to be global leaders." You can watch this 4 minute profile of the founders on the Today Show and get a great overview of their program here. The organization focuses on girls because two-thirds of the world's illiterate adults are women, each year 15 million girls are married before they turn 18, and education for girls is still an exception rather than the norm in many places worldwide. As they go on to explain on their website, an educated girl "earns up to 20% more as an adult with each additional year of schooling, is less likely to marry early... and has fewer, healthier children." She's the First partners with local organizations to provide scholarships for girls to reach graduation, as well as providing them with after-school programs and mentors to help guide their progress. There is also a global leadership curriculum for STF scholars and girls on campus chapters around the world. 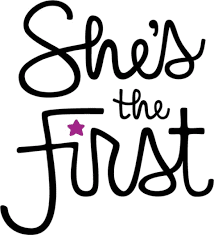 With 200 campus chapters and 1,100 scholars, the impact of She's the First is widespread. A few of their successes include: a girl in Gambia who takes photos of her classmates, charges a small fee and is saving this money to go to college and support her dream of being a photographer; a girl in India who graduated high school and hopes to become a software engineer instead of work in a rock quarry; and Tizita Hagare from Ethiopia who starred in Angelina Jolie's movie Difret. You can visit this page to read more scholar stories and watch additional videos. 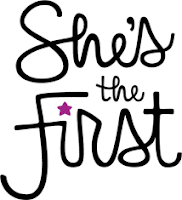 If you'd like to help She's the First support girls around the world you can shop for merch, start a campus chapter, make a donation and share the social media love by liking their Facebook page and following them on Twitter @shesthefirst.